Making an IPA is nothing new for Hop Nation. Their first beer was The Fiend, an Australian hopped IPA. Then the brewery came to be loved for its hazy and New England-style IPAs like the Chop and Jedi Juice. So it could be easy for the team to put out a stock standard fresh hop IPA, with 100 percent Galaxy hops, and we’d all be in to it. On first appearances the 2019 fresh hop IPA seems pretty down-the-line. Clean malt bill (no haze to speak of), clear in the glass with fresh grass, peppery spice and peach aromas. There are vibrant passionfruit flavours, with a rounded bitterness that both lingers and drys. While many fresh hop beers – where the hops are picked and used as soon as possible rather than dried or processed – can come across as blunt or harsh at the end, the clean finish here is a nice surprise. This is where it gets interesting: to achieve the unique bitterness, the team added 50 percent of the 100kg of hops using a “hop back” method. Hop backs are devices used to transfer boiled beer through hops to pick up the delicious aroma and flavour with less bitterness. However, Hop Nation don’t actually have one so improvised and used the mash tun. The beer was then transferred into a fermenter where the other 50 percent of the hops were waiting in bags (tied to the bottom). Then came a five day ferment on the hops before the beer was transferred again to a new tank to be kegged. It’s an uncommon process but the result speaks for itself. 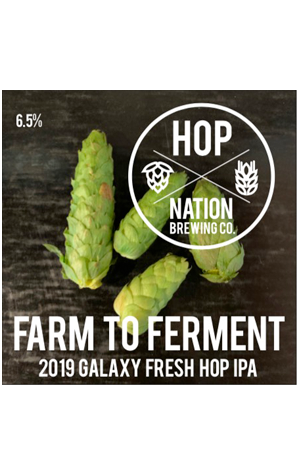 That said, for all that work – the brewers rushed their hop swag back from the Victorian High Country as the brew was already taking shape in Footscray – there are only around 40 kegs available, so be quick.